Back in February I had one of my greatest adventures ! 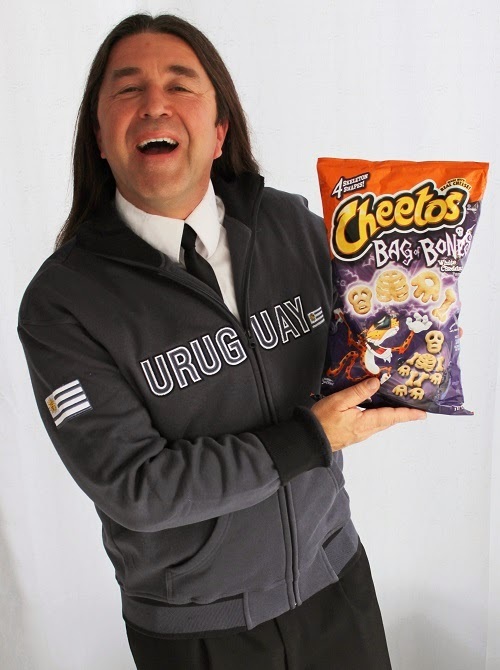 I auditioned on a Tuesday, cast with no callback on the Friday and was on a plane to Montevideo, Uruguay on Sunday to film the commercial for Cheetos latest offering Bag of Bones ! White Cheddar flavored Cheetos Bag of Bones. It introduces the product and the new character ‘Hatchet Jim’ played by yours truly. Thank you to the production team in Uruguay, you make the local film industry proud with your professionalism. Thank you to my friends at Frito Lay in San Francisco for treating me so good. Kudos to those creative folks in Boston who bring Chester Cheetah to life. Thanks to director Jeff Low for his confidence in me and my smokey laugh. But mostly thanks to Kelly Clayton for shuffling all over Buffalo, NY to bring me this here bag ! Sold out in most places ! This is gonna be a great ride. View the commercial here !